As I said in my earlier Everly Brothers post, ANY bootlegs of the famous duo automatically qualify as Rare Stuff. Even official live releases are few and (literally) far between . In that prior post of a 1997 show, I also mention that the only other Everlys boot I've ever found was a 1984 show from Jones Beach, NY, and I included a link to it over at Nathan's Rock Moat. But that blog has been shut down and relaunched since then, and the concert is no longer archived there. 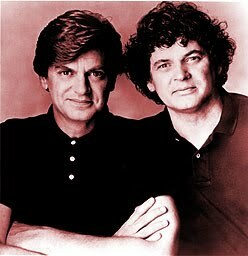 So, now it's archived here -- making this "your exclusive source of rare Everly Brothers shows on the net!" I like the sound of that! Though I'd be delighted to have somebody prove me wrong (see below). The most unique thing about this tape is that the Brothers perform an actual, bona fide NEW SONG here. Except for these few years in the '80s when they actually had some new material to plug, almost all their shows are strictly oldies affairs (but what oldies!). This concert takes place shortly before they are to go into the studio to record the release of their terrific comeback album, EB '84 (currently to be found over at Never Get Out of the Boat, alongside its likewise excellent follow-up, Born Yesterday), and they perform the reggae-tinged new Don composition, "You Make It Seem So Easy". Immediately after, though they make a near-fatal mistake: Don proceeds to tell the audience that Paul McCartney has penned a song especially for the forthcoming album -- but "we're not going to do that one for you right now." The audience practically riots, demanding that they play it! They clearly have no concept of a band actually having to REHEARSE a song before they perform it. You can bet the boys learned a lesson and never made that mistake again ("I'm sorry I said anything!" says Don)! Not to mention learned that song ("On The Wings Of A Nightingale") right quick. That's why I sure hope some tapes might emerge of Everlys concerts in the months and years after this show, featuring "Nightingale" as well as more of the top-notch material from those two mid-'80s albums. Anyone know anyone who knows anyone who might have such things tucked away somewhere and wouldn't mind sharing 'em? Meanwhile, if I want to know what they'd sound like... all I have to do is dream! All tracks @192kbps. The concert tape, it must be mentioned, has a very distant sound, with crowd noise and chat unfortunately much more prominent in the foreground than the music. It can get frustrating, but I reconcile myself to it while listening because of the rarity of the performance; I figure it sounds not much worse than it would if you were actually sitting in the audience at the show, in a not particularly good seat, with some noisy folks nearby -- except that you can't turn around and shush 'em. With that said -- enjoy! As always, much gratitude to the original taper and those who have shared it since. PS: As with the Big Star post below, if anyone wants to use this photo or another to make some proper cover art for this, please feel free to share it with the rest of the class! LINK MOVED TO COMMENTS -- so leave one when you get it, or it will be removed altogether. This is the only place you will find this tape. The least you can do is say thank you, or something about the artist. Courtesy shouldn't be The Rare Stuff. Thanks for the plug, PC. It's really neat to find this. I am a big Everly Brothers fan and appreciate this. Hey PC... I'm not a big fan of the Everlys, but I'm gonna say thank you for posting even if I don't get it from you. I enjoy your blog and would hate to see you get so frustrated that you stop. I really liked all of your E. Costello gap fillers... thanks again for all those. Oh I forgot to say... sorry I haven't been by the site for about a month, but was on a family vacation in a section of the country where internet access is limited (let's just say that there were lots of Amish folks in the area). You always put up some very cool stuff! Hi again Puffin, welcome back. A vacation from technology can be a good thing once in a while. I appreciate your taking the time to stop by and comment! Hey, if you haven't gotten into Del Amitri before, sample some of that stuff - literate pop a la Elvis, you may enjoy. And Anon, I'm glad you appreciate the Everly stuff! Thank you for this rarity. I have all stuff that I can find but did not know about this one. @ http://oled-longtimelistener.blogspot.com hope y'all like it! Hi Luuk, do you have any other Everly rarities that you might be able to share? If you don't know how to upload stuff to a file-sharing site, I could walk you through it. You're welcome for this one! Ole -- you're the best! I love it! So many cool and cute little touches... the graffiti, the stencils on the guitar cases... and once again there is a little animal off to the side (the bird) -- perhaps that is your "signature". Thanks so much! You are so welcome. Glad you appreciate all the little touches... god is in the details. The bird is a reference to the nightingale of the song. Thought about the dog... maybe next time! why are bloggers so hung up on the "Thank yous" Never understood that. Can't force everyone to say thanks, it's impossible. That said, thanks for the elvis costello stuff. Hi Anon, you're welcome... and of course don't expect everyone to say thank you, or even close, but... do you have a blog yourself? If you did, I think you might understand. I used to do a radio show, and just getting one or two calls from listeners during it made you feel like people were out there appreciating what you do. I didn't have to get calls from every listener to the station. Ideally, a blog is a conversation with an audience. Anyway... thanks for saying thanks. Just found your site... Must say, it is great! Thank you very much. You can't go wrong with Phil and Don!! Just wanted to let anyone interested know, there is a cover for this Everlys post at http://oled-longtimelistener.blogspot.com free for the taking. Enjoy and leave a comment if you like! I'm late getting to this (and the blog itself) but thank you anyway for ALL the Everly posts. I was fortunate to see them once a year after the reunion until they decided not to tour anymore. They ALWAYS were a thrill to see & hear perform...and Albert Lee on Guitar (and Phil Donnelly & Larrie London & Pete Wingfield) was a big part of me going, too. Last time I saw them they did a mid-set mini-set of acoustic bluegrass tunes...they could have had a new career just doing Louvin Bros, Blue Sky Boys, Delmore Bros, Monroe Bros etc ...I wonder why they duidn't consider that and what were they thinking on that THIRD Polygram LP/CD which was SUCH a disappointment. BTW, I have ONE cassette of them post-reunion that someone gave me. Have to check it against your two and see if it is ANOTHER that we all can share. I feel VERY lucky that I got to see them as much as I did AND Roy Orbison a couple of years before he passed (magnificent!) and Ricky Nelson 6 months before he passed (mind-blowing). I am also honored that I got to open for CArl Perkins back in the early 80s also as part of a great Honky Tonk band. Please where can o buy these everly brothers video? Please!! !